In 1751, Denis Diderot and Jean le Rond d’Alembert edited the 17-volume Encyclopedia: the Rational Dictionary of the Sciences, commonly known as the Encyclopédie. These heavily illustrated volumes were designed to teach people to think critically and objectively about all matters in the 18th century. Diderot said he wanted to “change the general way of thinking.” His ambition created quite a stir. 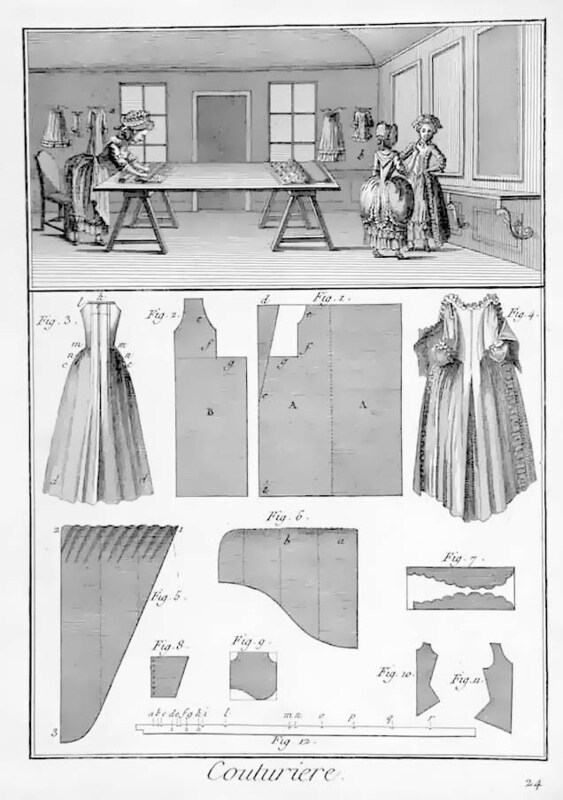 This survey of French crafts and trades just before the Revolution, includes such things as how a bodice is made, a riding jacket, gloves, hats – all the patterns laid out flat. Included are the workrooms for glovemakers, tailors, hatmakers – the spaces of craft and trade: where is the dress cut and stitched? where does the dressmaker or the tailor sit as they fell a seam? what is the space like in which the hat is sold? In the Encyclopédie they are austere rooms flooded with light from tall many-paned sash windows. These rooms are never deep and usually have windows on two facing sides. Because these are crafts and trades, furniture is the work bench, a sturdy work table, open shelves and sometimes a cabinet. Accompanying the plates illustrating the garment, and the plates showing the spaces, are the plates of tools, the instruments of the craft: a catalogue of needles, of stretchers, of hat presses, of shears. The above illustration from Onsite Review shows how the pattern for a riding outfit is laid out on the cloth. The width of the cloth varied. Wool cloth was wider than brocade, for instance. 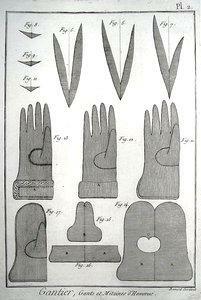 With Diderot’s publication of these plates, the knowledge of how to lay out these patterns became standardized. 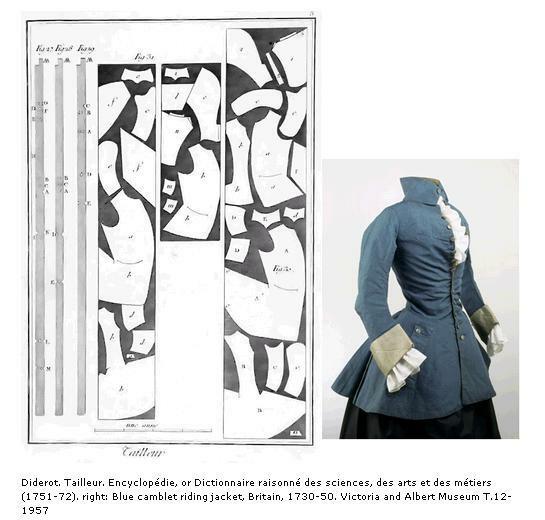 Onsite Review’s article, Diderot: Cutting Your Coat to Fit the Cloth, is fascinating to read.